Unlikely ‘collaborative’ project involving re-makes of Canadian artist Rob Ring’s video work via re-enactments of fictional historical events from 19th century early cinema and the 18th century Black country mining community. 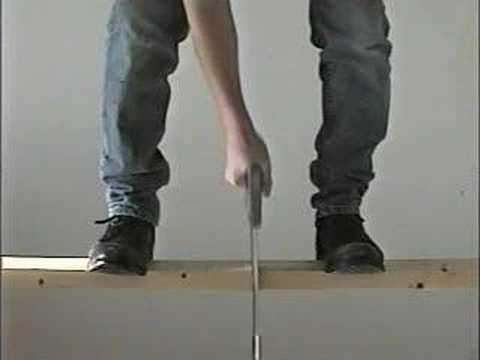 One day Chris was trying to work out how to upload onto youtube; he eventually uploaded a video of himself standing on a piece of wood whilst sawing it in half. This was up for approximately a year when one day, out of the blue, Chris received an email from a Canadian artist called Rob Ring effectively accusing Chris of plagiarism. Chris had a look at Rob's website, and yes, whilst the pieces were practically identical, Chris had never heard of Rob Ring before and had certainly not ripped Rob off. Chris was slightly perturbed at these accusations, so he did rip Rob off my re-making another of Robs pieces titled 'Ultra Hustle Dance Party'. Chris then emailed Rob with a link to this video - 'Dead Ringers' - claiming that it won first prize at the fictitious Birmingham International Film Festival. Rob took this in good spirits, but emailed back saying he wasn't prepared to engage in a 'video battle'. Chris was slightly disappointed at this, so he emailed Rob back asking him what direction he thought the work should go in now. Rob replied that he would be prepared to work in collaboration with Chris: they would send DVDs to one another of each others work, which they would then parody as each felt appropriate. After delivering a Rob Ring inspired lecture at Camberwell College of Art, chris+keir embarked on two Rob Ring inspired commissions: The Great Rob Ring (Flatpack Film Festival) and Robert Ringford: Gandhi of the Midlands (Longhouse). These appropriated Rob's work into the 18th century black country mining community and 19th century Canadian Vaudeville respectively.